A partial or full rotator cuff tear comes about as a result of precipitating trauma, although not necessarily a major trauma. The rotator cuff is only about 5 millimeters thick, so an injury at the level of slipping on ice can do it. You fall on the ice, you hit your elbow, and you think you jammed your shoulder. It kind of pinches the cuff and compresses it, and it’s a little weaker so it can possibly tear. Or you’re doing something like coming down from a ladder — you make a misstep and grab the rung so you don’t fall, which strains your shoulder. Such injuries cause increased pain and prompt people to go to the doctor, although usually after one week people will simply be sent home with anti-inflammatory medication. At four weeks, physicians typically will order magnetic resonance imaging (MRI), although when they find a tear, it’s often quite a bit more than four weeks old. People can do pretty well with a small rotator cuff tear. Most often, when people have shoulder pain, it’s just tendonitis and doesn’t necessarily indicate a tear in the rotator cuff. Tendonitis is more common than a rotator cuff injury and comes from wear and tear. There’s only a certain amount of room for the rotator cuff to fit, and it’s just rubbed underneath and gets inflamed. Most often, tendonitis is due to activities like common yard work — snow shoveling, leaf raking or spring yard cleanup — that requires repetitive motions the body doesn’t otherwise often make. This brings to the forefront a low-level, bothersome thing. People are not, by nature, complainers. What gets them in the office, typically, is that they can’t sleep. For tendonitis, we usually recommend physical therapy, which causes many patients to roll their eyes. Patients think we’re just giving them something to do, but a focused therapy program over six months will give significant relief. The problem is, many people don’t want to wait six months. 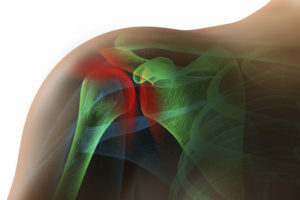 Shoulder injuries take time to heal, even if the rotator cuff isn’t torn. We recommend using anti-inflammatories, ice and rest. See your doctor after four weeks if the pain hasn’t gone away — if it’s not better with appropriate, on-your-own treatment. Use ice more than heat, and stay away from extremes. By rest, we mean use it for normal daily activities, but not a lot of repetitive lifting or repetitive, over-the-top motion. If you’re the 45-year-old road warrior who wants to play softball, if you throw and it hurts every time, you know what we’re going to tell you.